Every quarter, the Kansas State Historical Society holds a review off nominations to the national and state registers of historic places. They post on Twitter what's being nominated, pictures and short histories of the places which is nice because it may be the only way an average Kansan can see some of these places. The P.J. Lindquist Building was built in 1901 and is located along Main Street in downtown Lindsborg. It was originally constructed to house Lindquist's tailor business on the ground floor. Later, a restaurant and bakery occupied the ground floor. From 1913 until 1922, the building housed the Tea Cup Inn. Peter J. Lindquist was born in Skoda, Sweden in 1872. He purchased the lot and built this building in 1901 after immigrating to the U.S. in 1892. He married Lindsborg native Anna Swenson in 1895. The Census and Sanborn maps show the Lindquists living in the second-floor apartment possibly due to financial hardships during the Depression. Although built for Lindquist's tailor business, the commercial space was rented out for most of the Lindquist's ownership of the building. Anna Lindquist sold the building in 1946 six years after her husband died. The best known business that occupied the Lindquist Building was The Tea Cup Inn, owned and operated by Mary Linderholm who moved to town and opened up the Inn after her husband died in 1912. Her daughters worked as the waitresses. Mary closed the Inn in 1922 due to her daughters growing up and living their own lives. Since then, a variety of businesses have occupied the ground floor until 2006 when the building became vacant. It was purchased by its current owner in 2013. For more information, go here. 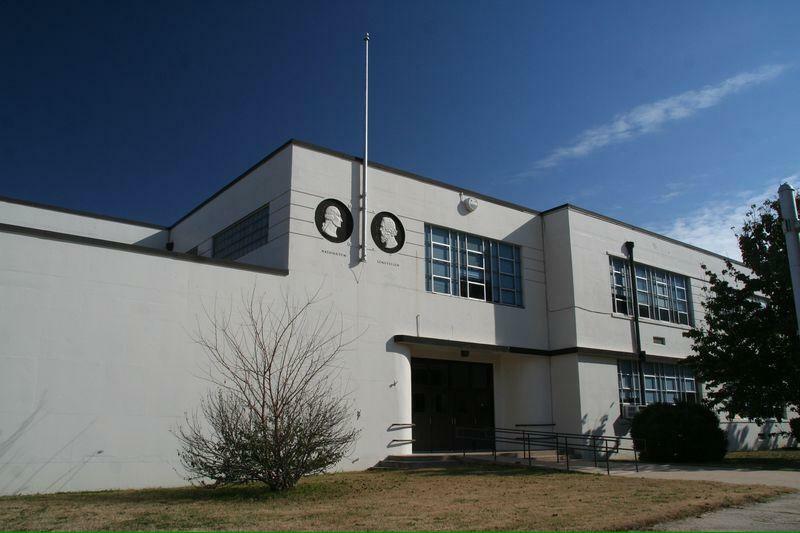 Washington School was dedicated in 1940 and was part of a WPA project. The two front entrances have rounded corners and a built-in clock over the south entrance. Washington is a two-story concrete building designed by Thomas Williamson. It served as the Ward One Public School from 1940 until 2011 when it was closed when a new school was built. The interior features 14 classrooms, two for each grade, a Kindergarten room, art and music room, kitchen, lunch room, and assembly room with a stage. Washington School was built quickly as, since it was a WPA project, ground had to be broken by the end of the year (1938) and completed within one year. In 1991, Washington became the school that housed the fifth graders until 2011 when Jefferson Elementary School was built to house 3rd-5th graders. Washington's sister school, built at the same time, Lincoln Elementary was sold to the hospital and demolished while Washington was recently sold and will be converted into apartments. For more information, go here. This beautiful Collegiate Gothic building was built in 1929 to replace another school that was on this site. It was named after Anna Bown and Jenny Corby, two longtime school teachers in the Marion school district. Corby would be the principal of Bown-Corby School from its opening until she retired in 1941. 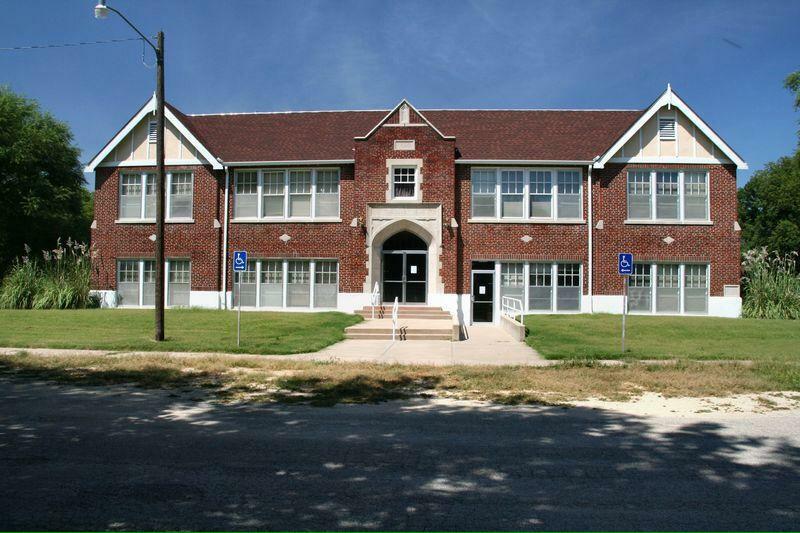 Bown-Corby held classes for grades Kindergarten through 8th until 1961 when a new modern elementary school was built. Bown-Corby then held Kindergarten through 3rd grade until 1992 when it became the Marion County Community College until 2012. It was recently purchased by a developer who plans to renovate it into apartments. For more information, go here. Belfry Hill is a natural rise of about 70-100 feet near the center of Council Grove. Early photos shows a bare mound with no trees or vegetation. By the 20th Century, the hill was covered with mature trees creating a beautiful backdrop to downtown Council Grove. Terracing was placed around the hill in 1901 in an effort to clean up the hill. Since then, the area has been a popular tourist attraction. 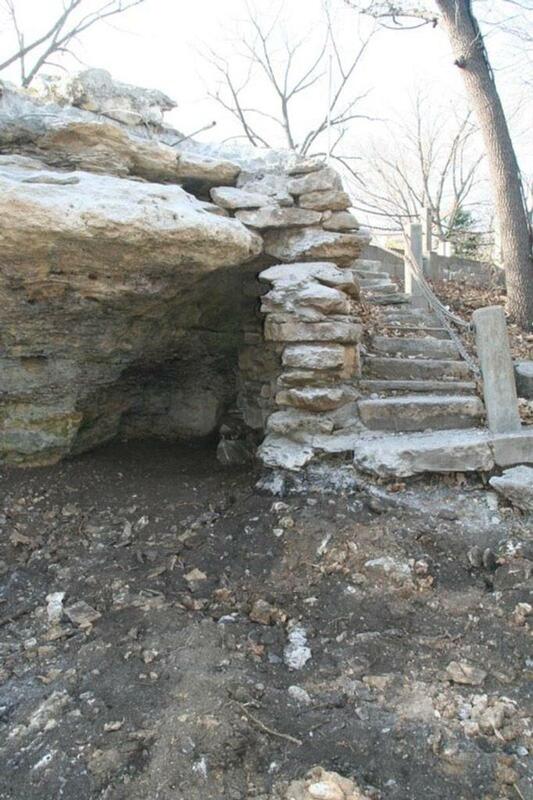 Hermit's Cave is located on the eastern bluff of Belfry Hill. A stone staircase leads from Belfry Street to the cave. For five months in 1863, Father Giovanni de Agostini (Father Francesco) stayed in the cave while traveling the Santa Fe Trail. He became known as the Hermit Priest thus giving the cave its name. Another feature of Belfry Hill is the Old Bell Monument. 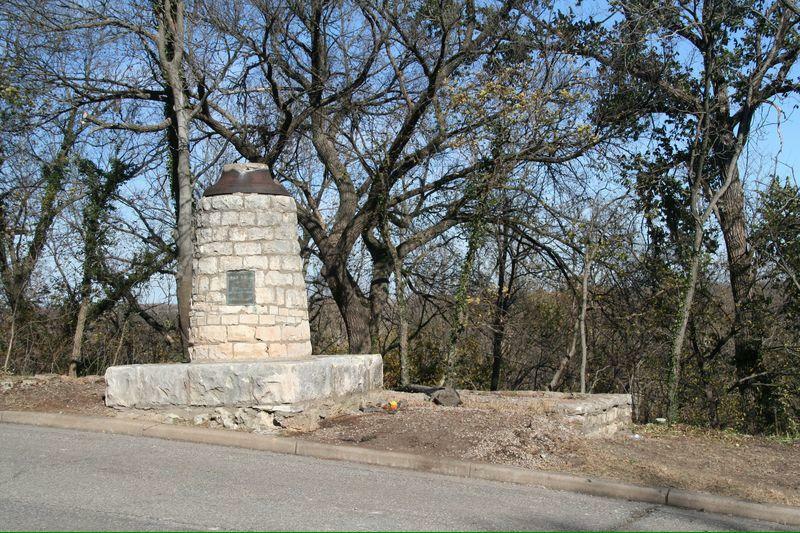 Nearly nine feet tall, a limestone obelisk hold the remains of a bell placed there in 1863 that was used to warn the townspeople of Indian raids, however, this is inaccurate. The bell broke in 1884 but was rescued and attached to this stone monument in 1901 after a group of schoolchildren raised money and stone for the memorial. Initials of the schoolchildren are carved into the stone. The bell was purchased from the Plymouth Congregational Church in Lawrence in 1863 after it was rejected for having a crack. The bell was used until 1884, even tolling all day when President James Garfield died in 1881, when a wind storm destroyed the bell tower and the bell rolled down the hill and was further damaged by vandals. The bell was used as a flower pot until 1901 when the monument was constructed. John Robert Fix came to Kansas Territory with his parents in 1856. Upon heading westward from Leavenworth, the hills along Mill Creek reminded them of the hills in Pennsylvania so they decided to preempt a claim along the West Branch of Mill Creek in western Wabaunsee County. Fix enlisted in the army during the Civil War and witnessed the engagement of the Monitor and the Merrimac, the Battle of Gettysburg and the Seven Days Fight. After the war, Fix went to Indiana where he married Rebecca Larch. They returned to Kansas in 1866. John built a sturdy stone house shortly after arriving on land just west of his parents original claim. In 1886, the Fixes sold a strip of land to the Chicago, Rock Island and Pacific Railroad. After the railroad was built a town, Volland, was established nearby. John Fix died in 1918, Rebecca following in 1922. The farmstead stayed in the family until 1955 when it was sold. John Fix, along with his wife, daughter, parents and close friends are buried near the farmstead in the Fix Cemetery along the railroad. 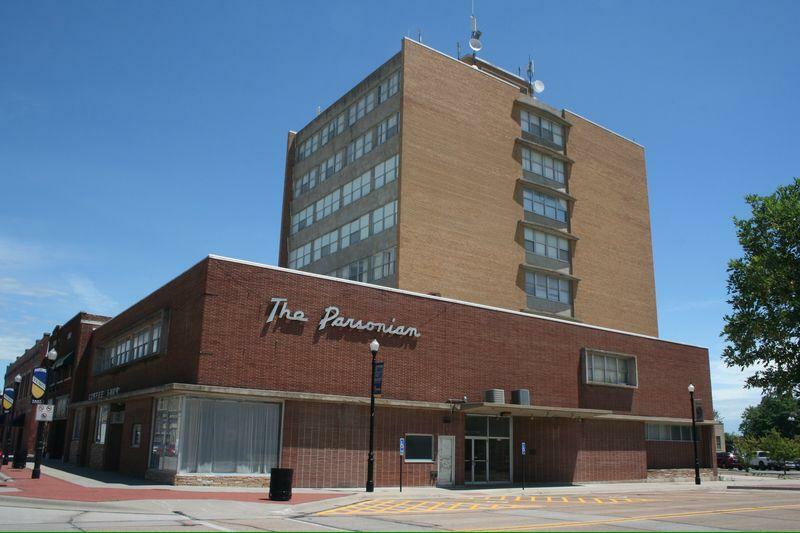 In 1954, the Parsonian Hotel opened with great fanfare. It was decided in 1951 that Parsons needed a modern hotel. The city had been trying to get new accommodations for years but the plans always fell through for one reason or another. The Parsonian demonstrates the Modern Movement Style of architecture that was common during this time and signified Parsons progressiveness. In total, the hotel is eight stories tall, red brick is used on the bottom two stories while yellow brick is used on floors 3 through 8. Sadly, eight years later, stockholders voted to sell the hotel in order to avoid foreclosure. It was then reopened as a hotel and convention center by Mr. and Mrs. Joe Bartelli but the hotel still struggled but remained a hotel and in the Bartelli family until 2008 when it was purchased by a developer to become apartments. The top two floors were completely renovated when the money ran out. The Parsonian currently sits vacant. 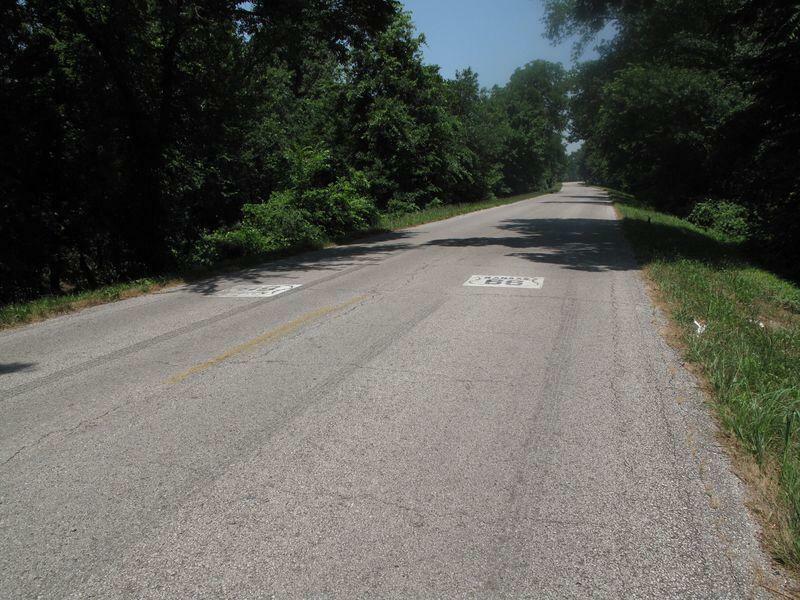 Historic Route 66 briefly enters Kansas in the southeast. It only goes 13 miles but all 13 miles of it can still be driven on and is well-marked. Route 66 came into existence in 1926 and connected Chicago to Los Angeles. 66 served the area until Interstate 44 became the primary transportation route. 66 was decommissioned in 1985. The nominated portion spans 2.1 miles from just south of the Brush Creek Rainbow Arch Bridge (1923, on the NRHP) to the Willow Creek Bridge. For more information, go here. St. Mary's Church was originally constructed in 1904 and was destroyed by fire in 1928. It was determined that it was possible to rebuild the church using the four walls that were still standing. The new church was dedicated in December of that year. 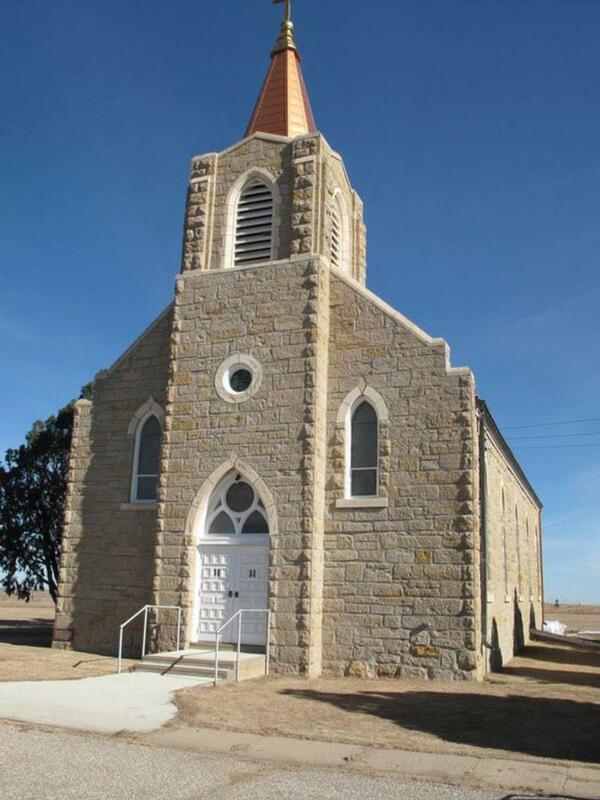 The church is a simple Gothic Revival and the land for the church and cemetery was donated by John Gleason who was the first person buried there in 1904 after a team of horses ran over him. The church was started in 1903 after the Irish congregation of St. Joseph's Church had a dispute with the German congregants. St. Mary's closed in 1997 due to a lack of priests but it remains well-taken care of and the nearby cemetery is still used and owned by the Wichita Archdiocese. The church is owned separately. At the time of its closing, around 30 families were still involved with the church. For more information, go here. 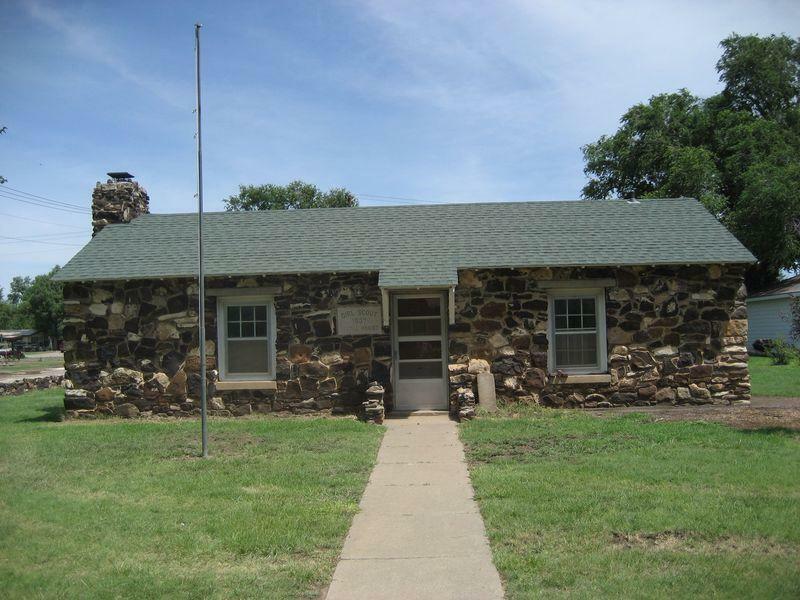 The Girl Scout Little House was built in 1937 by laborers employed by the WPA. The stone was quarried with native stone from a place north of Ashland and measures 20 by 40 feet. The Ashland Girl Scout Troop was organized in 1924 by Dorothy Berryman. After World War I, efforts were made for the Girl Scouts to build camps and club houses. The Little House movement began in 1923 and aimed to have the Girl Scouts own and maintain their own property. Ashland Girl Scouts worked diligently to obtain the funds to buy and quarry the stone, draft plans and help in the construction. 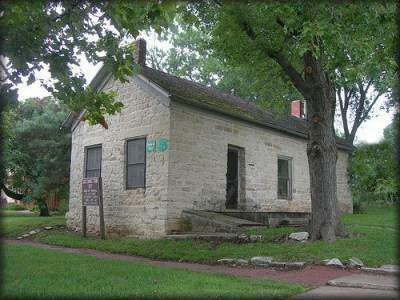 The Little House is currently maintained by the City of Ashland and is still used for meeting space. In 1941, the city commissioners of Winfield and Arkansas City met to approve a Class 2 airport with one hangar. In 1942, the government was interested in the location as a flight school. The cities leased some land and on November 1, 1942, Strother Army Air Field opened. As World War II came to an end, Strothers Field was put on standby. 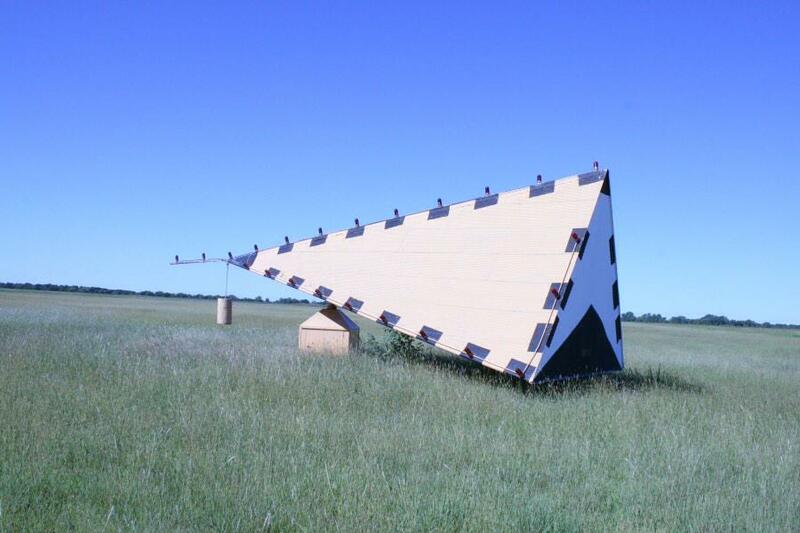 Since the airfield didn't have a control tower to assist the pilots, giant tetrahedron wind indicators were installed so that pilots could see which direction the wind was blowing from the air. The tetrahedron were made of thin metal and canvas. The Strother Field wind indicator even retains its original lighting which was used by pilots at night so they could tell the direction. For more information, go here. 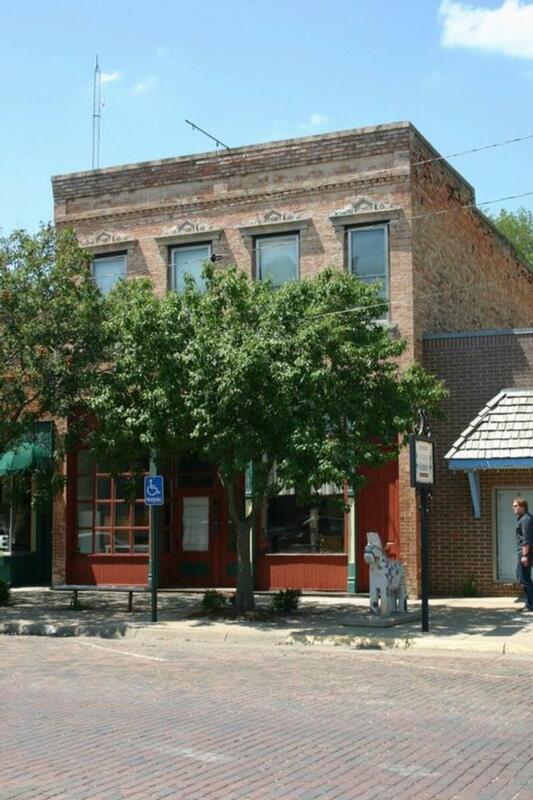 It was also decided to add The Last Chance Store in Council Grove to the State Register of Historic Places. 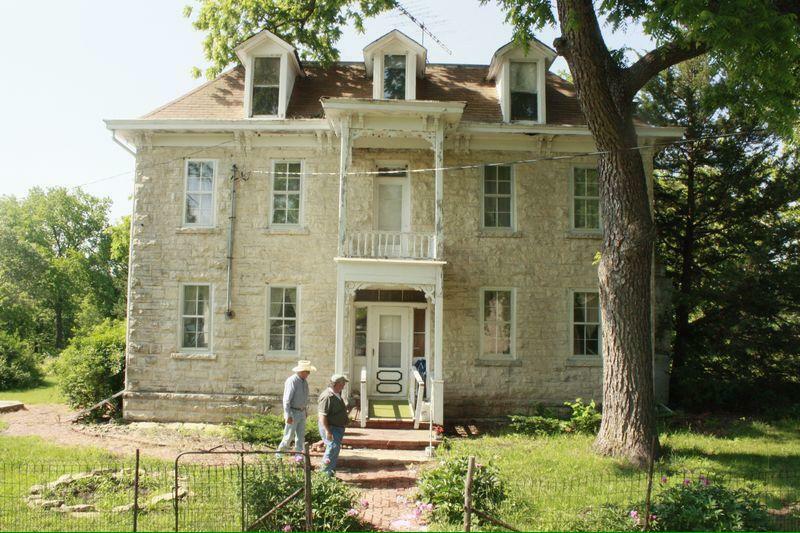 It was built in 1857 and was the last stop to buy supplies along the Santa Fe Trail for many years. Information and photographs courtesy of the Kansas State Historical Society.